Mount Mayon Volcano Level 4 – Bahala Na? The Mayon Volcano alert level has been raised to 4, which means an eruption is expected within days. This magnificent volcano, a subject often referred to here, is a jewel in the Philippines crown. If it had a gender then it would be a femme fatale – beautiful, mysterious, alluring, passionate and very, very dangerous. But romantic notions aside, she has the power to destroy, and at the moment she is particularly bad tempered. Thousands of people have been evacuated within a six mile radius, whose Christmas must be severely disrupted. 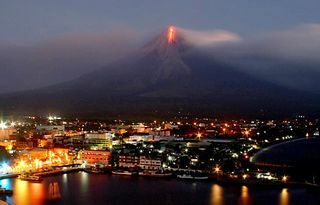 At present Mayon is emitting ash over a mile high, and at night lava can be seen incandescently dripping from her summit. She is notoriously fickle, and her alert levels have simmered between 1 and 2 over the past six months. Now it's reached critical and Philvocs are preparing for the worst. For the sake of all those who have homes and livelihoods nearby, it can only be hoped that she will settle down. The Philippines have suffered some severe natural disasters lately, with two back to back typhoons creating flooding and crippling the infrastructure, especially in and around the capital. As well as causing death and destruction, these events are a major drain on the country's financial resources, and it is a credit to their resilience and fortitude that they meet each one with strength and courage. There's a concept amongst Filipinos called Bahala Na. Roughly translated it means "God's will" or "leave it to God". Not unlike Que Sera Sera – whatever will be will be – but with more divine connotations. Whilst some critics decry it as passive and fatalist, most believe that it is this philosophical approach which defines their character and morale and supports them through crises and insurmountable trials. Whatever the reasoning, they are a people who are often visited with problems be they natural or man-made, so if "Bahala Na" helps them get through adversity then it must only be a positive thing and we should admire and respect them for it.